When I first started carrying a gun, nothing less than a cocked-and-locked 1911 in .45 ACP would do. After about a decade, I moderated my stance a little bit; caliber and action type were important, but not a deal breaker. However, I wouldn't have anything to do with pistols made by companies I'd never heard of. Today, my perspective has&apos;¦ matured. Add the scramble to pay bills that usually accompanies marriage and children, throw another decade of experience in--most of which I spent as a gun writer--and I've come to the conclusion that there's a place for every pistol out there, as long as it's reliable. In just the past year I've tested several pistols from companies I'd never heard of, and without exception they were reliable and ridiculously inexpensive. In that same time frame, I also tested a customized Remington 870, which cost $1900, and a $3,000 1911, which wasn't reliable. Sure, both the 1911 and the 870 looked a lot cooler than the Hi-Point or SCCY CPX-2, but the day I buy a gun I know isn't reliable or spend close to two grand on a pump-action shotgun, you'll know I suffered a closed-head injury. With my recent experience, when I was asked to review the TP9 from Canik 55, neither of which I had ever heard of, I said, "Sure, why not?" Canik 55 is actually a division of Samsun Yurt Savunma, one of Turkey's biggest defense contractors. While it probably has some historical significance, their small symbol of a dolphin is not something you often see on a pistol grip. They actually have a "Dolphin" series of guns, which are CZ-75 clones. The TP9, on the other hand, looks like a copy of the Walther P99. While the P99 might have been the inspiration, I actually like magazine release of the TP9 better. Both guns are a little too busy in looks for my taste, but I know some people just love the modern Walther look. The TP9 is a polymer-framed 9mm pistol with a 17+1 capacity. This is a full-size gun with a 4-inch barrel. The action type of the TP9 is a bit unusual. It is a striker-fired gun, but it works a bit like a DA/SA pistol with an exposed hammer. When you first load the pistol and drop the slide, you have the option of leaving it as is. The trigger will stay all the way forward if you don't touch it, but a light tug on it will reveal no pull weight for the first two-thirds of its travel length, then it will click into place. Pull the trigger then and the result will be a crisp 5-pound trigger pull. Or, you can hit the decocker at the top rear of the slide. When decocked, the trigger stays forward and you will get a long, traditional DA pull of about 10 pounds. The rear of the striker is painted red, and if you can see it through the hole in the back of the slide, you'll know it is cocked. The pistol has no external safety. The polymer frame of the TP9 accommodates interchangeable backstraps, and two sizes--small and large--were provided with the pistol. I have medium-small hands, and the large backstrap put too much bulk on the pistol for my taste, but those of you with larger hands will probably like it a lot. One of my big pet peeves are gun makers who only supply their semi-auto pistols with one magazine. The TP9 comes with two 17-round magazines with polymer basepads. The magazines are made by Mec-Gar, known worldwide for its quality. 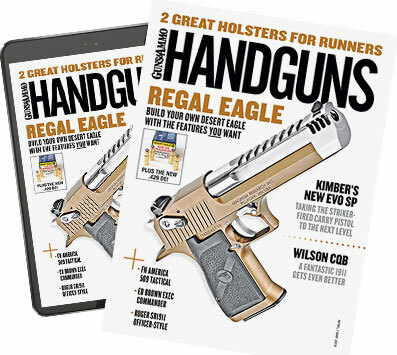 Mec-Gar is the OEM magazine supplier for a number of well-known pistols, including the S&W M&P, Ruger SR9, and single-stack Para USA 1911 magazines. While the TP9 looks a lot like the Walther P99, I don't think their magazines will be interchangeable--I didn't have one on hand to test--because of the difference in the magazine releases. The Walther P99 has an ambidextrous lever-type magazine release that runs along the bottom of the trigger guard. The Canik 55 TP9 has a traditional magazine release on the frame behind the rear of the trigger guard. The mag release button is square, metal and aggressively checkered. The frame has subdued finger grooves on the front, with horizontal serrations to improve gripping on the front and back. The sides of the grip are textured as well. This is a full-size pistol weighing 23 ounces with a grip that fills the hand, chambered in 9mm--aggressive checkering is not needed, as felt recoil isn't bad at all. Sights are a 3-dot variety filled with luminous green paint--hit 'em with bright light and they'll glow in the dark for a while. The rear sight is adjustable for windage. Both front and rear sights are polymer, and in my opinion, meet the bare minimum requirement, but the pistol shot point of aim. The TP9 also comes with an injection-molded holster that features a locking mechanism very similar to the Blackhawk! Serpa, and both a paddle and belt loop attachment. That's not a bad deal for a pistol that is selling online for about $350. That's hundreds of dollars less than you'll see the Walther going for, but no pistol is a deal if it isn't reliable. So how did the TP9 do? I put several hundred rounds through my sample TP9 and didn't experience a single malfunction, due no doubt to the well-made magazines feeding into a ramped, fully supported chamber. Accuracy hovered around three inches at 25 yards, which is pretty average for this size/type of gun. In this economy, it's tough to find the money to buy a new gun, much less afford the ammo you'll need to feed it, but having a reliable pistol which starts out less expensive than the competition is a good start.